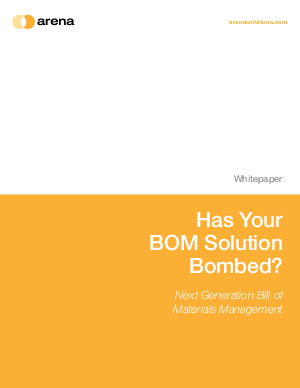 > Arena Solutions > Has Your Bill of Materials (BOM) Solution Bombed? In the world of product development and manufacturing, the bill of materials (BOM) is a critical product information record for engineering and manufacturing teams. However, compressed product lifecycles, geographically dispersed project teams, cost pressures, outsourced partnerships and stringent regulatory requirements are challenging traditional BOM management and communication in numerous ways. New, automated BOM management solutions are helping companies effectively manage and communicate product information and succeed in a competitive environment. This white paper reports on how these innovations are helping accelerate new product introductions, improving collaboration with outsourced partners and suppliers, and enabling organizations to achieve compliance with confidence.